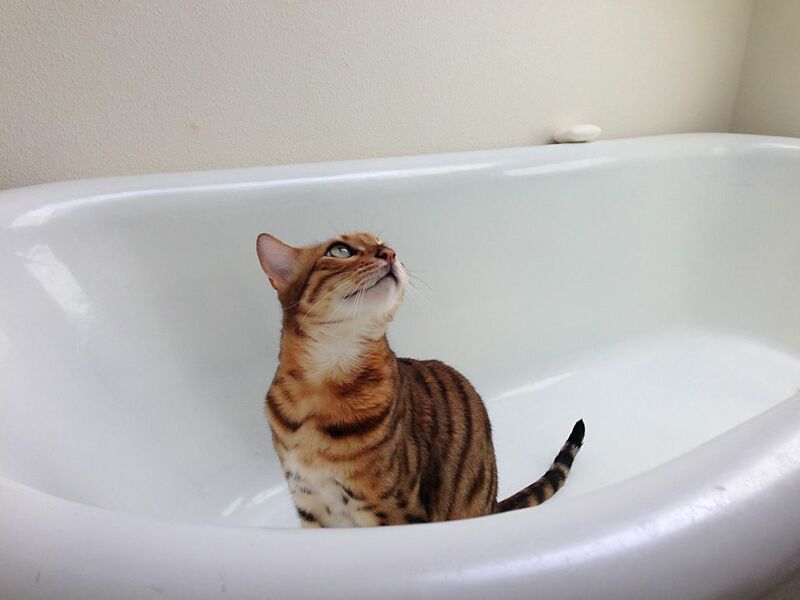 If your cat has started peeing in the bathtub, take notice. Any time your cat urinates outside the litter box, you should have your vet examine it to rule out a medical problem. Cats are known for getting urinary tract infections, and male cats get urethral blockages. If the cause isn't medical, there could also be environmental and behavioral reasons for the change; for instance, many cats won't tolerate a litter box that is less than immaculate. One of the first signs of an infection or blockage is urinating in odd places. Seeing blood in the urine or straining to urinate is common with an infection. You may also see your cat frequently licking its private area, crying, and meowing. If you notice any of these signs, it's important to have your cat checked out by a veterinarian as soon as possible. Your veterinarian will examine your cat's overall health with a general physical exam, palpate the abdomen and bladder, and likely run a urinalysis to check for infection or crystals in the urine. Additionally, your vet may want to run blood work to check kidney and liver function. Prompt treatment is needed for an infection or blockage. In particular, urinary blockage can be fatal if not addressed swiftly. Once a medical problem has been ruled out by your vet, environmental and behavioral problems can be examined. For instance, a smelly litter box might cause a cat to go elsewhere in your house. Keep a clean litter box by scooping every day—and multiple times a day if more than one cat uses the box. You will also want to perform a deep clean every couple of weeks, as a cat's sense of smell is strong. It's possible that the box smells bad to your cat, especially if it's shared with other furry friends. A hard-to-reach litter box can also send a cat elsewhere for its business. If your cat is a senior, putting a litter box in a place where the cat has to climb stairs may be a problem. Choose an easy-to-reach location that is away from noisy machinery, like washing machines. Additionally, changing to a different type of cat litter can upset your cat. If you've changed the litter recently, change it back or add an additional litter box with the older litter until the cat adjusts to both types. Having a multiple cat household where one cat bullies the others causes peeing outside the box, particularly if the bully obstructs the path to the litter box. The best way to handle this problem is to add additional litter boxes to the household, so one is always available. You also want to avoid covered litter boxes in multiple cat households, as they may make cats feel like it can't see if another cat is approaching. Stress can also cause cats to pee in odd places. If your indoor cat can see outdoor cats in your yard, she may feel threatened. While it's easy to believe that your cat is angry or lazy when it doesn't reliably use the litter box, you don't want to ignore​ the behavior. There could be a serious medical problem, but if it isn't medical and you've supplied a clean litter box (in an easy-to-reach location with the cat's favorite litter), you may need to consult with a cat behaviorist for extra help.